To celebrate St David's Day we made Welsh cakes and cawl, dressed in traditional Welsh costumes, painted pictures of daffodils and sang the song 'Rwy'n Hapus Heddiw' (I'm happy today) during our Eisteddfod. We are very proud to be Welsh! We have created a hairdresser in the classroom. The children have been making hair appointments for clients, cutting, dying and curling hair (don't worry only pretending). They are having great fun learning through role-play. 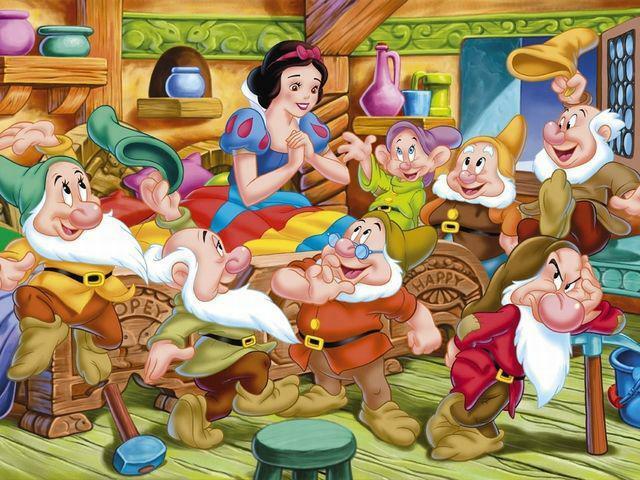 We are having great fun dressing up as Snow White and the Seven Dwarfs and playing in the dwarf's cottage. Using pastel crayons we have been looking in a mirror and drawing pictures of our beautiful faces. We found out that Jack and the Beanstalk is our favourite fairy story by making a pictogram on the Smart Board. Our least favourite story is Little Red Riding Hood. Using the big wooden blocks we worked together to make a castle. It was great fun and we learnt to name the different parts of a castle. Our topic this half term is called 'Dinosaur Days.' We will be learning all about life long ago. We will be visiting the 'National Museum Cardiff.' The children will attend a workshop where they will have first hand experience of handling artefacts related to dinosaurs. The children will have great fun finding out how dinosaurs lived by exploring a range of information books and listening to many stories. In our outdoor learning area we went on a dinosaur hunt. We found many different types of dinosaurs. We named and counted them. We found a Tyrannosaurus's footprint in our classroom. To measure the size of the footprint we used the footprint of Godwin and Mrs Stephens. We needed 8 of Godwin's footprints and 5 of Mrs Stephens' footprints to measure the same as the dinosaurs. We had a wonderful time learning about dinosaurs when we visited the National Museum Cardiff. We made some dinosaur biscuits in Ty Coffi. We ate them and had a milk shake in the cafe when we returned from our trip to the museum. The milk shake was delicious, however the biscuits had no sugar in them and tasted different!!!! Working together we have designed our own dinosaur land. We showed good drawing skills and knowledge of how dinosaurs lived. We have been using the Smart Board tools to draw our favourite dinosaur and write a matching sentence. We found out what was our favourite dinosaur in the Reception class. We created a pictogram using the computer program 2Count to record what we found. We have been pretending we are dinosaurs in our 'Dinosaur Den.' We have had great fun creating stories about dinosaurs. We used straws to create dinosaur skeletons. We had to cut the straws the correct size to make the skeletons. We have been learning to count and write adding sentences using dinosaurs. Using junk we created our own 3D model of a dinosaur. We had such fun using a variety of materials. Doesn't he look smart? We were palaeontologists using special tools to uncover dinosaur fossils. We were able to find out the names of the dinosaurs we found by searching on the computer.